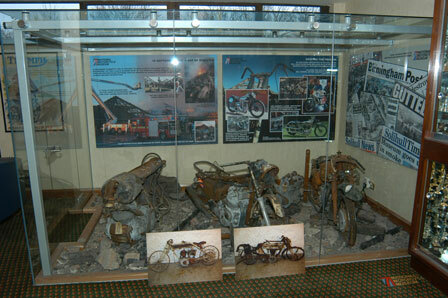 On 16th September 2001, the museum was badly damaged by a fire, hundreds of the motorcycles were destroyed beyond recognition, demonstrated by this stand before the entrance of the museum, it is a remarkable achievement of the restorers of the work they have done. A few years on and the restoration work is ongoing, hundreds of fire-damaged bikes have been fully restored, the work is remarkable. There are currently (January 2005) over 600 bikes in mint, original condition, ranging from 1898 to 2003 bikes, catering for all age groups. Included are small, large, superbikes, tricicles, quads, commuters and even drag bikes, race bikes and record attempt bikes, all in first class condition. The motorcycles are spread over five halls. The National Motorcycle Museum has to be one of the largest motorcycle dedicated museums in the world, opening originally in October 1984, with 350 motorcycles on display. Following the devestating fire in September 2003, the museum officially re-opened in December 2004. As a result of the success of the museum, they also provide banquetng and conference facilities from 1985. Over 250,000 people are attracted to the museum every year. All bikes are restored to the manufacturers' original specification, cataloguing the British motorcycle industry from the start. It is with regret that 380 motorcycles were lost in the fire, although 150 of which were restored for the re-opening in December 2004, they current display over 600 bikes, with a taget of displaying 800 by 2007.